500 metre (or "outright") record is held by Paul Larsen. On 24 November 2012 he sailed the Vestas Sailrocket 2 at 65.45 knots in Walvis Bay, Namibia. Nautical mile record is held by Paul Larsen. On 18 November 2012 he sailed the Vestas Sailrocket 2 at 55.32 knots in Walvis Bay, Namibia. 24 Hour distance record is held by Pascal Bidégorry. On 1 August 2009 he sailed the Banque Populaire V 908 nautical miles (at 37.84 knots). This was while he was breaking the northern Atlantic record. 28 October 2010 Kitesurf Sebastien Cattelan FRA Lüderitz, NAM 55.49 102.76 63.8 14 minutes before Robert Douglas' record. Homologated by the WSSRC. 4 September 2009 l'Hydroptère - hydrofoil trimaran Alain Thébault FRA Hyères FRA 51.36 95.11 59.1 Nautical mile record broken on the same run. An instantaneous maximum speed of 55 knots was recorded. Last updated: 19 November 2012. 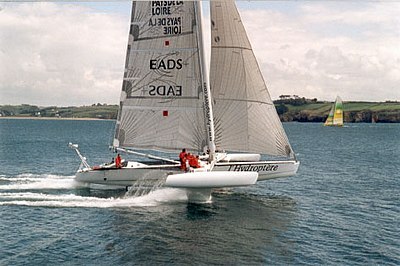 8 November 2009 l'Hydroptère Alain Thébault FRA Hyères FRA 50.17 92.91 . 4 September 2009 l'Hydroptère Alain Thébault FRA Hyères FRA 48.72 90.23 500 metre record broken on the same run. A Day's run is the distance traveled by a vessel in one day, normally measured from noon to noon. This was the traditional measure used in the days of packet and clipper ships and varied in the actual time dependent on whether the vessel was sailing east or west. The records certified by the WSSRC since 1994 are based on a 24-hour distance measure irrespective of longitude. Note that the nineteenth century records are not strictly compatible as they measure a "Day's run" which was measured noon to noon regardless of longitude. The two entries above were both eastbound and therefore less than 24 hours. Previously, the highest speed ever reported was from the crew of l'Hydroptère. During an attempt on 21 December 2008 at Port-Saint-Louis-du-Rhône, they recorded a top speed of approximately 61 knots (speed not verified or registered on any onboard instrumentation) during a 45 knot gust of wind. This heavy gust of wind overpowered the sailboat, causing it to capsize at high speed. The crew sustained only minor injuries. Sovereign of the Seas, 1852, 258 ft, the fastest and longest ship yet built when she was launched in New York, designed and built by Donald Mackay, America's foremost clipper designer. On her maiden voyage, she sailed New York to San Francisco in 103 days. This ship achieved the fastest ever recorded speed of a sailing vessel (22 knots)..
^ a b "Vestas Sailrocket. Outright and NM". WSSRC. 2 December 2012. ^ "WSSRC Records - 24 Hour Distance". ^ Paul Larsen (28 November 2012). "BLOWN AWAY... THE 65 KNOT+ RUN (WITH VIDEO)". Vestas Sailrocket. This page was last edited on 27 May 2018, at 04:51 (UTC).